← 5 necklaces added to Etsy. …because my life isn’t all about the jewelry. After staying up late last night to watch football, I worked on the Sunday NYT crossword puzzle which was challenging but fun. It’s not really feasible to subscribe to the Sunday Times up here on the island. It’s very expensive and usually arrives a day late. I could have it sent over from the newspaper store in N.E. Harbor, by boat, but it wouldn’t get here until 4 p.m. on Sunday and by then the weekend is almost over. So, I subscribe to the NYT crossword puzzles on line. I download the Sunday puzzle on Saturday night and then stay up until I finish it. Woo Hoo! Wild fun on Islesford. I had the most relaxing Sunday. I started work on my next column for the Working Waterfront, watched some football with my husband and took a long nap on the couch. After a brisk walk at sunset, we spontaneously invited our friends Henry and Donna over for pasta primavera. I am so fortunate to have a husband who likes to cook, especially at this time of year when his boat and lobster traps are out of the water. Bruce made the pasta dish and I made a little salad of avocado and pineapple, and we had fresh baked coconut chocolate chip cookies for dessert. At this time of year we do not feel rushed, and I love it. I am not a fan of the single-use kitchen gadgets. I don’t mean disposable things like sponges or scrubbies, but those items that take up a lot of room in the drawer or cupboard and they only serve one purpose. So when Santa put a rather large pineapple-corer-slicer-thingy in my stocking a few weeks ago, I thought it was a candidate for the regift pile or the white elephant table at the Islesford Fair. 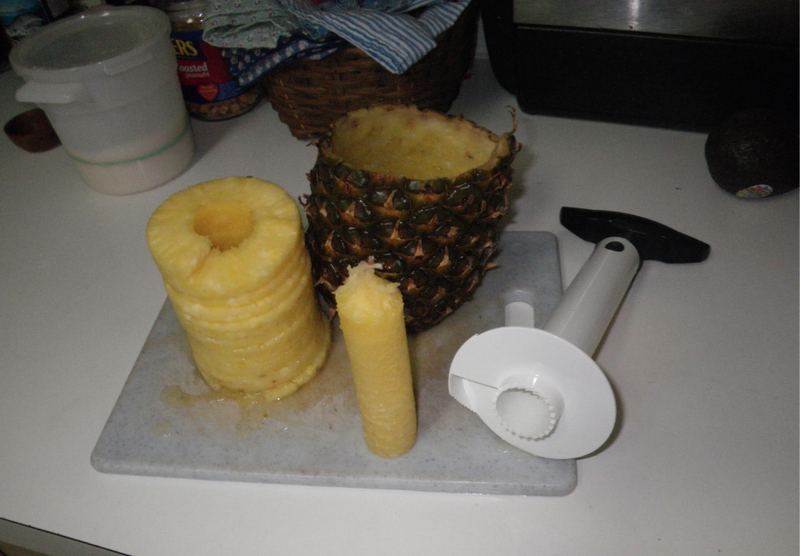 Last week, with a pineapple about to rot beyond edibility on my counter, I took the pineapple-corer-slicer-thingy off of its cardboard sleeve and gave it a try. I’ll be damned. The thing actually worked! And it worked well. Well enough that I made sure to buy another pineapple the other day when I was off the island at the grocery store. I couldn’t wait to show my lobsterman chef husband what a useful gadget it was. All you do is cut the top off the pineapple, place the pineapple-corer-slicer-thingy on the freshly cut surface, and twist. When you reach the bottom of the fruit, you pull up and out comes the inside of the pineapple, neatly sliced, with the outer shell intact. Good times with a one-hit wonder and no more pineapples rotting on the counter. cool. maia got it in her head that she’s allergic to pineapple and won’t go near it…maybe a cool kitchen gadget (she likes those!) will tempt her back to the world of pineapples! Hmm….what if Maia really IS allergic to pineapples? well, yes, i suppose that’s a possibility. evan gets a slightly itchy roof-of-the-mouth when he eats certain fruits (as i did when i was a kid), and i suspect it’s THAT that she might be talking about…we have benadryl and an epi-pen in the house just in case (wink, wink). that little critter can be quite stubborn, so i suspect actually NOTHING will lead her back to pineapples till she’s nearly grown up!!! Nice words from a fellow story writer! See you soon!